The Code Enforcement Department is staffed by a licensed Building Code Official who holds a combination of titles as a Residential Building Inspector, Commercial Building and Accessibility Inspector, Zoning Officer, and Sewage Enforcement Officer. The Department is also supported by a State licensed Third Party Agency for commercial plan review and inspections. State licensing and continuing education are important and required responsibilities of a properly staffed Code Department. 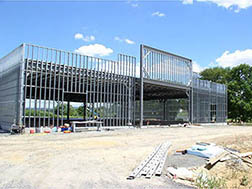 The Code Enforcement Department reviews and inspects all permit required construction activities within the Township, issuing more than 700 permits per year since 2004. The Department reviews and inspects construction projects totaling approximately $30,000,000.00 of construction value every year. The Department reviews permit projects ranging from fences and sheds to schools and hospitals for compliance with applicable codes and ordinances. Particular attention is paid to the federal Americans with Disabilities Act (ADA) to be prepared for State audits and to provide Township infrastructure that meets the needs of all its citizens. In addition to Building Codes, the Department administers and enforces the requirements of the Zoning Ordinance, Property Maintenance Code, the Code of Ordinances, and a Property Transfer Ordinance. The Zoning Ordinance of 1940 is the first Ordinance of the Township of Spring and regulates the use of land and structures in the Township. The Property Maintenance Code requires land and structures to be maintained in a clean, safe and sanitary condition. The Property Transfer Ordinance promotes the sale of residential property in a safe and compliant manner reducing the number of unpermitted structures and property nuisances. The Code of Ordinances provides additional authority for the Code Department to enforce curb replacement, unobstructed streets, unobstructed storm and sewer right-of-ways, clearance of snow from sidewalks and similar requirements that facilitate the continued daily operation and function of the Township. The future of the Code Enforcement Department will involve continuing education and additional code certifications to meet the expanded qualifications under the State Uniform Construction Code. The Code Department continues to increase its presence and community relations in the pursuit of safe structures and property with a vigilant regard for the protection of health, safety and welfare through the proper application of various State Laws and Local Ordinances.